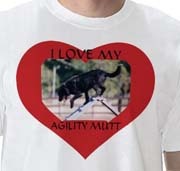 Add your personal touch to these dog agility shirts, buttons, stickers and more. Have you ever seen a design you loved but you had a better idea for the text? Well here is your chance. You pick the design then keep the existing text or replace it with your own - your choice. Instead of scrolling through a long list of dog agility titles, just type it in. Customize your dog's agility records with this Agility Binder. Upload your dog's photo and add text if you like. Keep the classic heart frame and put in your own dog's photo, or change the words. No need to scroll through endless identical images just to find your breed or special mix, just type in what you want. Sure, getting a Q, a qualifying score is one but the game is pointless if you aren't having fun. If you have a better way to share agility fun, just personalize the text. 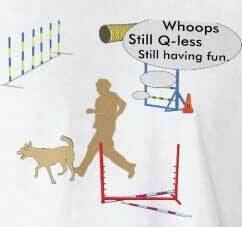 Dog agility is as fun as you will let it be. 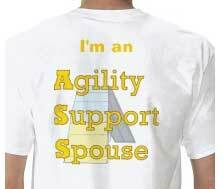 Do you have a better caption for this agility shirt? Just change the text to read the way you like it. 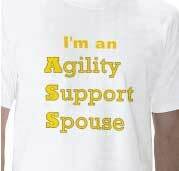 Where would agility be without the supportive partners? They haul equipment, set up the shade, hold the dogs and step in as "volunteers" at the gate and for course building. No wonder that some feel slightly like a ... well you can read the initials. The top text can be personalized. Just type text in the box below to change the text "I'm an" to whatever you like, or keep it as is. If you are new to the sport of agility check out these books for getting started such as The Beginner's Guide To Dog Agility, Competing In Agility - Entering Trials And What To Do When You Get There or Do It Yourself Agility Equipment. 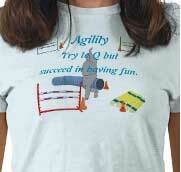 If you are looking for agility equipment shop carefully. Even if you just want to play at home, be safe. You can build the equipment yourself, or you can purchase it. Think twice before getting flimsy equipment. Competition may not be in your mind now but it can be really frustrating to try undoing bad habits caused by inadequate equipment. Agility training gets to be addictive because it is so much fun. It is spreading because even people in isolated communities are finding ways to get together. One portable piece that isn't so easy to make for yourself is the Agility Chute that folds down into a carrying case for portability. Also available are Agility Equipment starter sets that aren't so flimsy that they teach your dog to go slow.